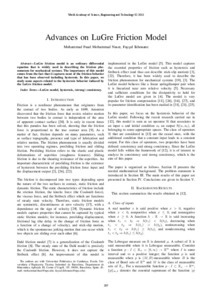 Fuad, M.; Ikhouane, F. Advances on LuGre friction model. A: The World Academy of Science, Engineering and Technology. "World Academy of Science, Engineering and Technology". Paris: 2013, p. 207-212.